There are people who plan carefully for the future—folks who weigh all the advantages and disadvantages of major decisions, then make life changes in careful, graduated steps… My wife Ann and I are not those people. When we announced to family and friends that we were selling our home and moving to the beach town of Salinas, Ecuador, they were—to put it mildly—shocked. Looking back, I can’t say that I blame them. They had never heard us talk about Ecuador or even South America. But after a week-long trip in February of last year, we were hooked. The following month we purchased a beautiful 1,900-square-foot beachfront condo for $220,000. And two months later we announced that we were applying for a residence visa and moving full-time to Salinas before the year was out. I’ll grant you, this isn’t “normal” behavior. But it all made perfect sense to us. Neither of us knows how long we will be healthy enough to follow our dreams. Ann is 62 and retired; I’m 55 and still working, but I’m an IT professional and my work is all online. My office can be anywhere there is good Internet and good phone service. So why wait any longer? For us, now is the perfect time to do something. And we don’t regret the decision one bit. The weather is perfect. Salinas has two seasons: Temperatures half the year range from the upper 80s F during the day to mid-70s F at night. During the “cooler” half they range from upper 70s F to mid-60s F. Long-time expats tell us they rarely see temperatures above 92 F or so, or below 65 F.
We also find the cost of living low. We live very well on about $1,200 a month. This means we can use Ecuador as a low-cost home base that allows us to indulge our love of travel. A short walk from our condo is the Mercado de Salinas, a large, open-air market protected by a metal roof and open seven days a week. There you’ll find fresh fruits, vegetables, meats, seafood, eggs, rice—just about everything you need. And the prices! The first time we visited one of the vegetable vendors, we picked out a head of lettuce, four tomatoes, three carrots, a cucumber, two onions, some green peppers, and a couple of spicy red peppers. Our vendor told us the price, and we thought we heard him say $12.50. We thought, wow, great deal. I handed him the money and he shook his head. It was $2.50! Similarly, fresh eggs are $3.50 for 30; large shrimp goes for $4 a pound; tuna or sea bass fileted right in front of you is $3.50 a pound; pineapple for $1; a pound of strawberries for $2—I could go on and on, but you get the picture. There are stalls selling rice, flour, beach items, clothing, gifts…we still haven’t explored the whole market. But why Ecuador in the first place? Well, the more we studied it, the more we liked it. Ecuador ticked all the boxes on our checklist. For climate, you have a very diverse country where you can choose your preferred climate and find a location to match. The U.S. dollar is the national currency. Prices are low. And foreigners have the same rights of property ownership as nationals. A big plus for me was working remotely—although it is on the Pacific Ocean, Ecuador is in the Eastern time zone. We canceled the rest of our tour and decided to stay in Salinas looking for a property on the malecón. We settled on a building we liked, the Alamar, right on the malecón across the street from the ocean. We didn’t find what we wanted while in Ecuador, but we stayed in touch with our real estate agent. Within a month she had found us a four-bedroom, four-bathroom condo on the 19th floor, and we jumped at the chance. From our condo we can hear the surf, and we have spectacular views of the sunrise and sunset. In the common areas, we have access to a theater room, saunas, a hot tub, exercise room, pool, kiddie pool, and a beautiful area for just sitting and enjoying the sun. A full 24/7 staff provides concierge services, cleaning, security—even help getting our groceries upstairs. 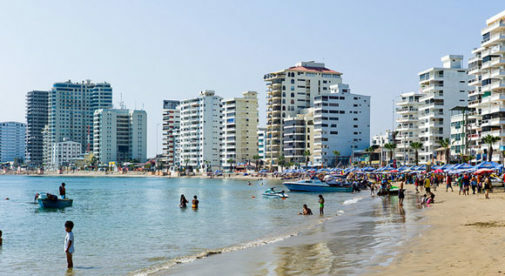 Salinas has three beautiful beaches that are connected by a nice brick walkway along the malecón. We walk out the front door, cross the street, and we are on the beach. We can turn right and walk up to San Lorenzo, or left and walk down to the Salinas Yacht Club and Chipipe Beach. Chipipe is one of our favorites—it features a wide, soft, sandy beach with a gentle surf. We have already found so much that we love about our new home, and we can’t help but wonder: Would it have been the same if we’d waited a few more years for my retirement or some other goal before taking the leap? Would we have still been healthy and able to enjoy the Salinas lifestyle in five or six years? Maybe so, but why put off the good life when you can be healthy, happy, and live well now for so much less, to boot?